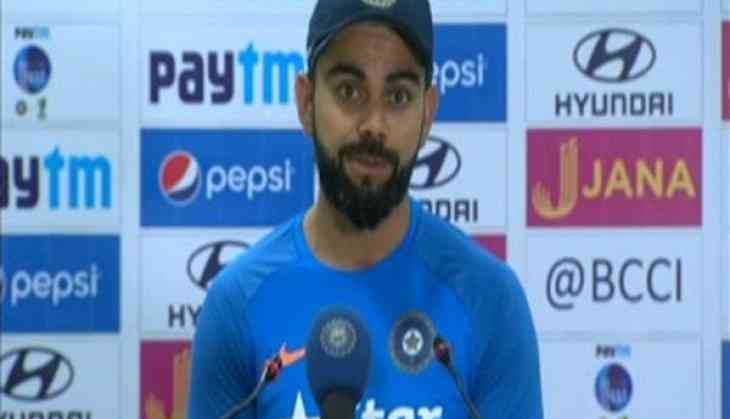 Indian skipper Virat Kohli on 14 June called on his side to stop dwelling on their past laurels and not to take Bangladesh for granted in the second semi-final encounter of the Champions Trophy at the Edgbaston Cricket Ground on Thursday. Speaking on the eve of his side's last-four contest, Kohli said that they are looking forward to continue the momentum they have gained so far in the tournament and display a similar kind of competitive performance as they did against top-ranked South Africa. "We have been quite a few times in these kinds of games before. But, there is no guarantee in sports. As you have seen in the league stages as well, a lot of teams have surprised. We are certainly not taking anything for granted. We will use whatever momentum we have gained in this tournament to execute what we want to. We will not be going according to the past results. Going to big games like this, we will be treating it like we treated our last game. And our mindset does not differ," Kohli told the reporters. Kohli also could not stop himself gushing over the `competitive` Bangladesh side, saying that the latter have taken huge strides and improved their game in the last couple of years. "It's no surprise anymore to anyone that they are doing really well and they have improved their cricket, credit goes to their set-up and the kind of players they have. Now they are taking more responsibility. They are a very dangerous side and everyone realizes that. No one takes any opposition for granted. Bangladesh have taken huge strides. They themselves say that in the last couple of years. Even in the World Cup 2015, they were really good," he said. The swashbuckling Indian skipper believes that the current Bangladesh side include a lot of skilled cricketers, who are committed to play with passion and win games for their country. "They are in the top eight sides in the world. So obviously they are playing really good cricket. They are doing lot of things right to be in that position. There are cricketers who are skilled, who are committed to play for Bangladesh with a lot of passion and they are really keen to win a lot of games at this level. And this shows their attitude. They are a very competitive side," Kohli added. Talking about the Playing XI, Kohli said that Ravichandran Ashwin performed very well in the virtual quarter-final clash and therefore, they are most likely to go with the same squad in the upcoming match. "I think Ashwin was brilliant in the last game. And I don't see any good reason to change that. The team played really well. It was a complete performance. I certainly don't think that there is a need to change anything," he said. While Kohli's side booked their place in the last-four with an eight-wicket win over South Africa, Bangladesh paved their way to the semis after registering a five-wicket victory against New Zealand. The Men in Blue will head into the clash as favourite, after topping the Group B table with two comprehensive wins.